The ring with orthodox prayer "Save and Protect"in Russian ("Спаси и Сохрани"). This amazing ring has protective qualities and spiritual benefits. The inscription in Russian. 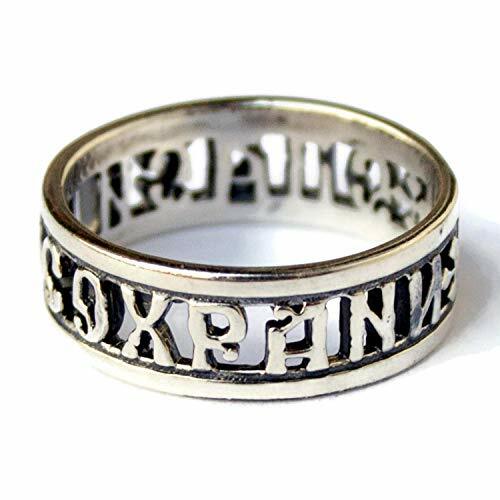 This ring can be worn by men and women. Material: Sterling silver (925). Oxidized for deeper contrast. Worldwide shipping from Ukraine. The delivery to the US and Canada takes appx 2-3 weeks, Europe 1-2 weeks, South America, Asia and Australia 3-4 weeks. If you have any questions about this product by Mia Silver Studio, contact us by completing and submitting the form below. If you are looking for a specif part number, please include it with your message.